← On Sale! Special Price for Limited Time! Welcome to Texas! 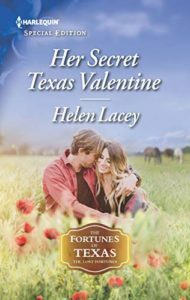 And to my latest book for Harlequin Special Edition, Her Secret Texas Valentine. I’m delighted to once again have the opportunity to write a story for the Fortunes of Texas continuity. When sweet (but slightly spoiled) Valene Fortunado hooks up to a dating app, she has no idea she is about to meet a man who isn’t anything like what she imagined she wanted. Cowboy Jake Brockton doesn’t tick any of her boxes. She was looking for a suit…and instead found a Stetson! But attraction is a funny thing. And so is love, as this seemingly mismatched pair quickly discover. Jake has been badly burned in love in the past and has no real desire to get back into the saddle. But Valene is hard to resist…and with Valentine’s Day just around the corner, he soon realizes they are a perfect match after all. Of course, the road to their happy ending is rocky, but true love always wins in the end. I hope you enjoy Jake and Valene’s story. I love hearing from readers, so feel free to contact me via my website, to talk about cowboys, horses and books! 2. A signed copy of ‘Her Secret Texas Valentine‘ for one reader. 3. Three readers would win Kindle Copies of ‘Her Secret Texas Valentine‘. I would love to win! Thanks for these awesome giveaways! Wow what a treat your books are always awesome. What an amazing giveaway. I love these stories. Love your stories. Looking forward to this one. A great story to start the year with. Congratulations on the new book. I like how the story sounds. Thanks for the chance to win. Hi Helen…awesome giveaway. You’re books make me smile. Congratulations on your new release. I read my first harlequin at thirteen! Fifty years ago! I always thought they were fun reading! Congratulations on getting in to print! My favorites are historical fiction. My mom wrote one back in 1982. She self published. you could be a great author.I will be sure to bookmark your blog aand drfinitely will come back dow the road. Thiis is my first time vidit at here and i am truly impressed to rrad all at single place. I love whjat you guys are up too. This sort of clever work and exposure! Keep up the good works guys I’ve included yyou guys tto my blogroll. then he must be pay a visit this site and bbe up to date every day. I wanted to thank you for thuis grfeat read! !